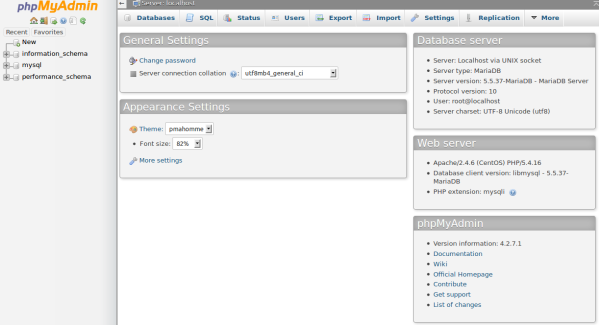 Phpmyadmin is an opensource tool to manage MySQL database using web browser. it can perform almost all tasks such as creating,deleting,modifying databases,users,tables and fields . This guide helps you to install phpmyadmin on centos 7. it contains step by step installation through YUM using EPEL repository. Before starting phpmyadmin installation, You must setup LAMP server on your centos 7 server. Copy and paste below command in terminal for quick setup . At the end, you need to provide some inputs . » leave blank for current mysql password. » provide new password and press enter for the rest. You can also refer this guide – Install LAMP server on centos 7 for more detailed setup. Step 1 » Download and install epel-release-7-x.noarch.rpm file . or install directly by copying the rpm link. Step 2 » Update repositories by issuing below command . Step 3 » Now install phpmyadmin package along with dependencies. Step 4 » After installation, Open /etc/httpd/conf.d/phpMyAdmin.conf file ( Apache config file for phpmyadmin ) and edit as follows. Step 6 » Now open http://serverIP/phpmyadmin in your browser. You can login using root as username and mysql root password. That’s it . Have a nice day. Works fine for me, thanks dude! Just a little correction ! Link in step 1 to install EPEL repo is dead. after install all step above and than yum -y install phpmyadmin I got “no package phpmyadmin available” please help.